LG OLED65E6V 4K OLED TV review | What Hi-Fi? 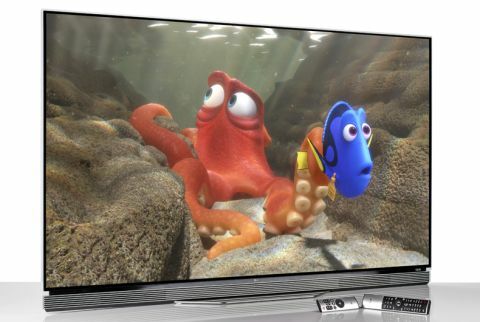 You may have already clocked the rather dear asking price for the LG OLED65E6V. You may well, by now, be mid-sigh, thinking what a shame it is that you’d have to cough up £5000 to get your hands on LG’s flagship 65in TV. Well, you’ll need to think again. Because this OLED TV actually sits just underneath the mothership model, the LG G6 Signature, which is another £1000 more. And while we doubt 3D support is a deal-breaker for many people nowadays, it is also present on this LG’s feature sheet. This LG OLED shares plenty of its big brother’s flagship qualities when it comes to the design, which is more of a talking point than it is with most TVs that are wheeled through our test room doors. LG calls the panel featured on the E6 and Signature G6 ranges ‘Picture on Glass’, which should be taken only semi-literally. The OLED panel – just a few millimetres thick – is fixed onto a transparent glass plate, also just a few millimetres thick. Protruding out from behind the panel, the plate acts as the bezel to frame the screen. Together they’re around half a finger-width deep – a slimness that simply wasn’t possible on a TV just a few years ago. The bottom third of the back panel sticks out a few extra centimetres, but it’s still a wonder how LG has managed to squeeze all the innards into such a slim physique. Thin doesn’t mean frail though; while it may look like it might not take the pressure of plugging in an HDMI cable without being steadied, and initially we did check the box to see if it comes with a child gate (it doesn’t), it feels more robust than you might think. What there is of it is, however, is exquisite. The OLED65E6V is a fine-looking slice of TV, and the finish of the glass and patterned back panel is just lovely. Between the panel and the centrally positioned base plate on which the TV sits, is an integrated speaker system, which out of context could pass for a truck’s front billet grille or a 1950’s radiator. LG calls it a ‘soundbar stand’. It has a 40W output and 2.2-channel configuration compared with the G6’s 65W and a 4.2 ability. Of course, the TV can be mounted on the wall instead, and if that’s your decision know that LG has housed most of the connections in the panel’s bottom left hand corner for easy reach. On the side are four HDMI (4K and HDR-ready) and three USB (one is 3.0) inputs. Around the corner on the back panel are component input, optical and 3.5mm outputs, and the LAN socket – although wi-fi is of course onboard for your convenience. Just note that you’ll probably need a wired internet connection to handle 4K streams. There’s no excuse for bad accessorizing at this end of the TV market, and LG hasn’t taken a back seat with the OLED65E6V’s two remote controls. This isn’t the customary traditional and smart wand offering, though. Like the handset that came with last year’s models, the main remote marries an on-screen cursor, operated by gyroscopic sensors, with physical keys for when your arms get tired. The new design is a silver affair: flatter, taller and curved at the front, with flat buttons taking up the top two thirds. The ribbed back, which apart from emulating the sound of a guiro when a pen is run across it, helps with grip too. It’s a straight-up upgrade over last year’s unit but, perhaps because of its bigger size, LG has felt the need to add a mini remote too. It’s flat, around the length of the Apple iPhone 6S, and a simpler quick-to-grab tool for accessing the home page and changing inputs, volume and TV channels. WebOS is back and better than ever before in its new 3.0 guise. More evolution than revolution, it revolves around the same OTT colourful card-launcher menu, only this time the spotlight is on two new content discovery features: My Channels and My Content, which flag up on the left-hand side of the menu and offer neat shortcuts to your favourite channels and content. Want to access Netflix’s Daredevil series without having to go into the app? No problem, simply pin it to the My Content tab. A search button lets you browse content across live and scheduled TV, YouTube and video-streaming services, and if you are at a loose end, there’s also a side bar for recommended channels and programmes based on your viewing habits. On the apps front, the newbie-friendly interface is home to Amazon, Netflix and wuaki.tv video streaming services, BBC iPlayer and Demand5 catch-up TV and Google Play. When we tested the LG OLED55C6V earlier this year, Freeview Play, which bundles Freeview TV with the full array of UK catch-up TV services, hadn’t arrived… and it still hasn’t, so you’ll have to hang tight for ITV Player or All4 until then. MORE: Freeview Play – What is it? Where can you get it? New to LG is an audio auto-tuning feature, designed to calibrate the OLED65E6V’s sound to your specific room conditions. All you have to do is point the remote, which has a microphone built-in, towards the screen and hold it still while it does its thing. It shows you the before and after results, and, we're happy to report, we picked the latter as it was obviously clearer and bigger. Needless to say, the soundbar stand offers an improvement in both insight and volume over a standard flatscreen TV’s speakers. And while it’s noticeably smaller, thinner and less solid than the flagship OLED65G6V’s soundbar performance, there’s weight and punch behind dramatic sound effects, and dialogue is solid and clear. Fundamentally, it’s picture performance that puts this LG 4K OLED's price into perspective. In one word, it’s stunning. Ultra HD Blu-ray discs are marching into our test rooms quicker than you can say ‘4K HDR’, and one of the latest is The Martian – a spectacular showcase for the OLED65E6V’s picture. Unlike some TVs we’ve seen, the LG helpfully flags its detection of a 4K, HDR signal with a pop-up banner, and automatically optimises the picture to specific HDR settings. There are three fixed HDR modes to choose from, or you can tweak to your heart’s content in ‘User’. We take it up on the invite, bumping up de-judder and de-blur in the TruMotion setting so that everything from slow camera pans to fast action happens without a hiccup. In reality, 4K and HDR content doesn’t really need flagging. The picture is simply too sharp and crisp to be passed off as Full HD, and the way the shiny space blanket and solar panels gleam is testament to the HDR technology at work. You hardly have to look for it, but when you do the benefits are even more apparent. Take a light bulb, for example: instead of it being a block of white light, you can see the outline of the bulb as well as the varying rays of light shining from it. While this may seem slight, it’s these things that add to the realism of the whole scene. Immediately eye grabbing, it has a precision that’s rare even for a 4K HDR telly – only matched, in our experience, by the LG OLED65G6V, which in terms of picture performance is very similar. There’s a real grittiness to the soil in which Mark’s potatoes grow (yes, really), and texture so tangible that staring at the sandy surface of Mars will have you reaching for a glass of water. Confident with colours – its reproduction seemingly as punchy and enthusiastic as possible without compromising realism – the OLED65E6 establishes the different tones of white on his spacesuit and the varying intensity of oranges in explosions. If nothing else, OLED has the edge over LCD with its famously deep black levels, which are demonstrated here by the black bars, Mark’s NASA t-shirt and pitch-black space. That doesn’t mean it suffers with brightness; stars stand out like a child in a pub at midnight, and generally the panel is capable of going brighter than you’d want it. Also typical for OLED, viewing angles are second to none. With Ultra HD Blu-rays costing £20 a pop, we’re glad standard Blu-rays haven’t been consigned to charity shop shelves (yet), especially when we have an upscaler like the OLED65E6V on hand. The drop in resolution and dynamic range is of course clear, but relatively speaking this is still an excellent picture with HD content, on par with the best Full HD TVs. High-definition streams and broadcasts are squeaky clean and stable, with not much to give away the mighty upscaling task needed to display them. Even DVD hoarders needn’t worry, for the LG keeps picture noise to a minimum, producing an image that’s perfectly watchable, even with old discs like Dirty Harry. From aesthetics to sound quality to picture performance, the OLED65E6V is a TV fit for kings. LG has been at the vanguard of TV technology for the past few years with its OLED panels, and this is yet another case of ‘it shoots, it scores’.